The old telescopic sight was replaced by modern reflector sight. 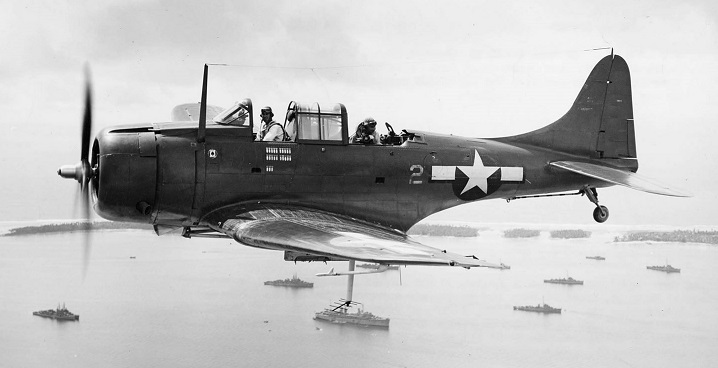 The SBD-5 had heated windscreen (because it sometimes misted over in dives). 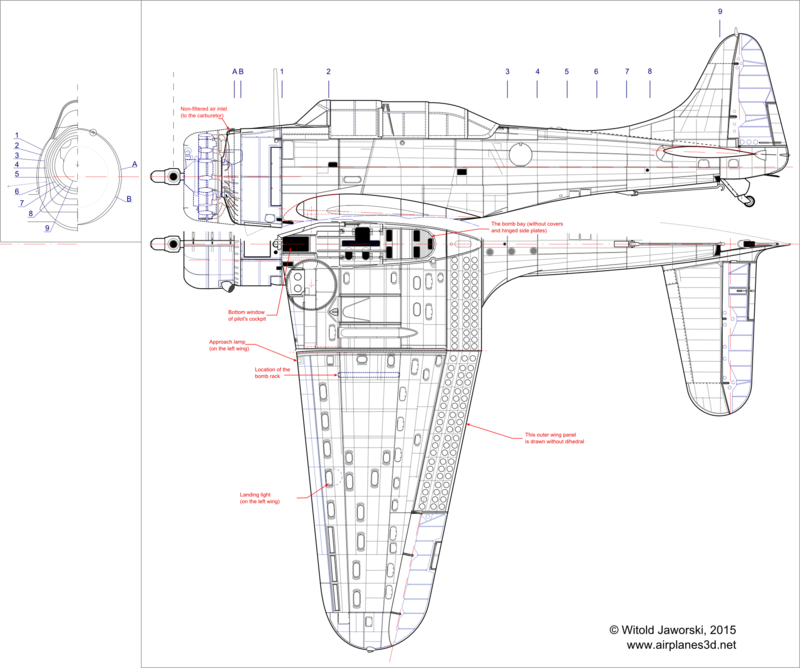 (See the high-resolution SBD-5 left & top view). The shape of the firewall (section C in Figure 11‑3) remains unaltered. However, there is a difference in the width of the gap behind the NACA ring. 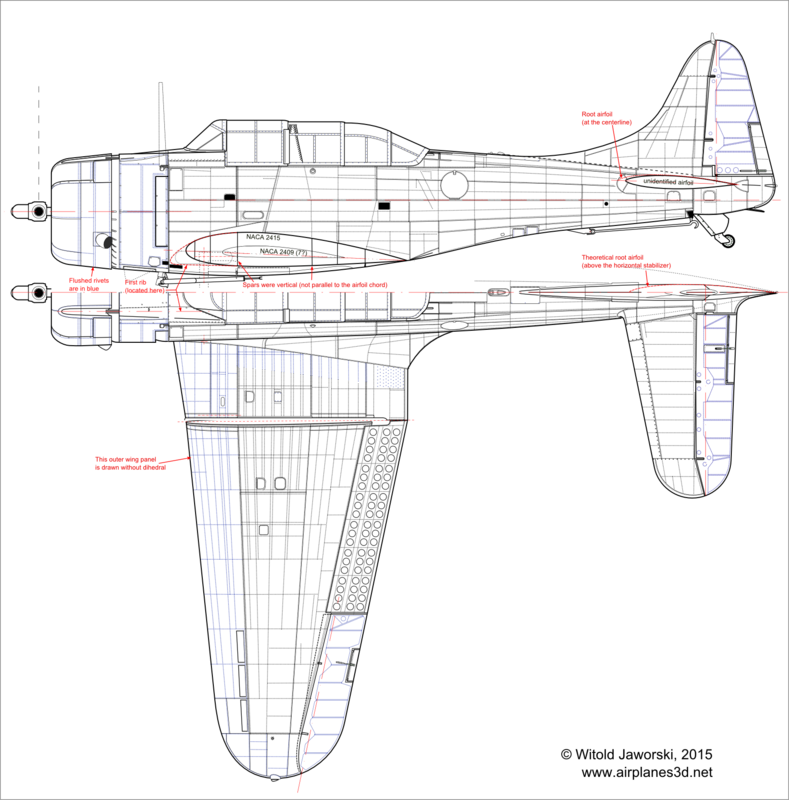 In the SBD-1 … 4 this gap was relatively narrow, and the cross section of the fuselage below (section b in Figure 11‑3) forms a regular ellipse. Thus in the previous versions the upper part of the NACA ring had six flaps. 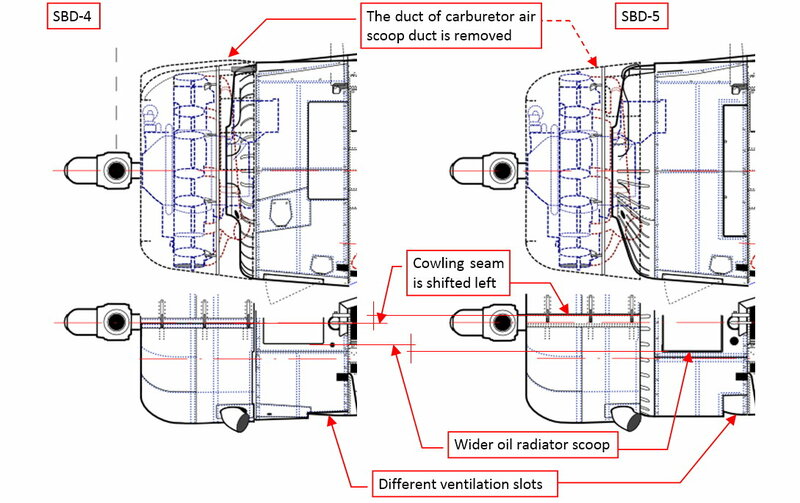 They controlled the flow of the cooling air through the engine. 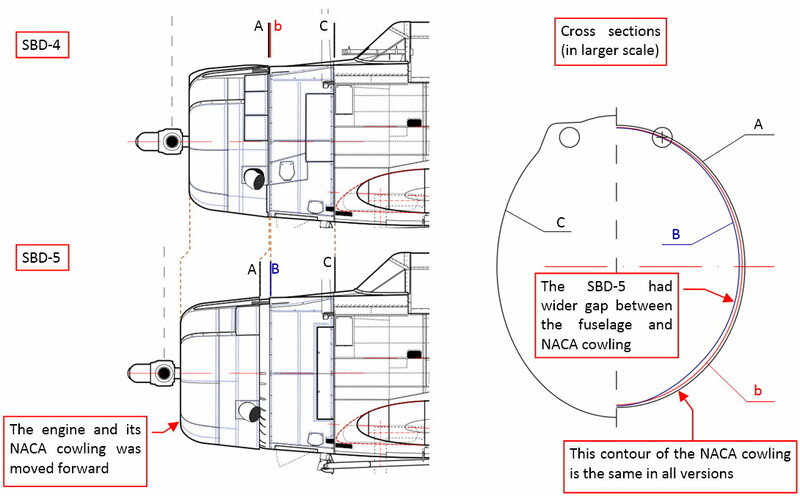 In the SBD-5 the fuselage was a little bit “thinner” here, and the bottom part of its cross section (section B in Figure 11‑3) had slightly different shape. 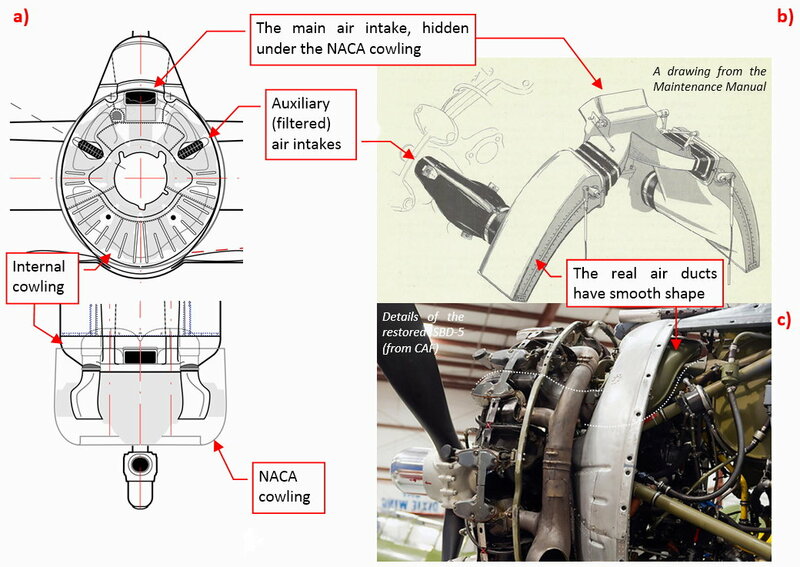 The larger gap between the NACA cowling and the fuselage increased the constant amount of the incoming air that cooled the engine. It allowed Dauntless designers to reduce the number of cowling flaps from 6 to just 2. (See the high-resolution SBD-5 bottom view). 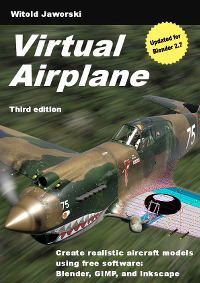 (See the larger SBD-5 front view). The side air scoops were filtered, while the central air scoop was not. I used the Pilot’s Manual to find that there was a switch to flip the carburetor air intake between the filtered and non-filtered air. The filters were auxiliary devices, intended for takeoff and landing on dusty ground airstrips. (You can see similar solutions in contemporary designs from 1943: P-40L and P-51C). In the Pilot’s Manual you can read that you should switch into the non-filtered (i.e. central) air scoop to get the full power from the engine. I must say that I was used to more streamlined carburetor air ducts. Such a location of the main air scoop is quite strange. It seems that the designers of the SBD-5 concluded that there is enough air behind the single-row radial engine to feed its supercharger. (In an airplane flying 100mph or more the amount of the air passing around the engine is several times larger than during takeoff. Thus such a solution could work if we assume that for the takeoff pilots used the less obscured side air scoops). 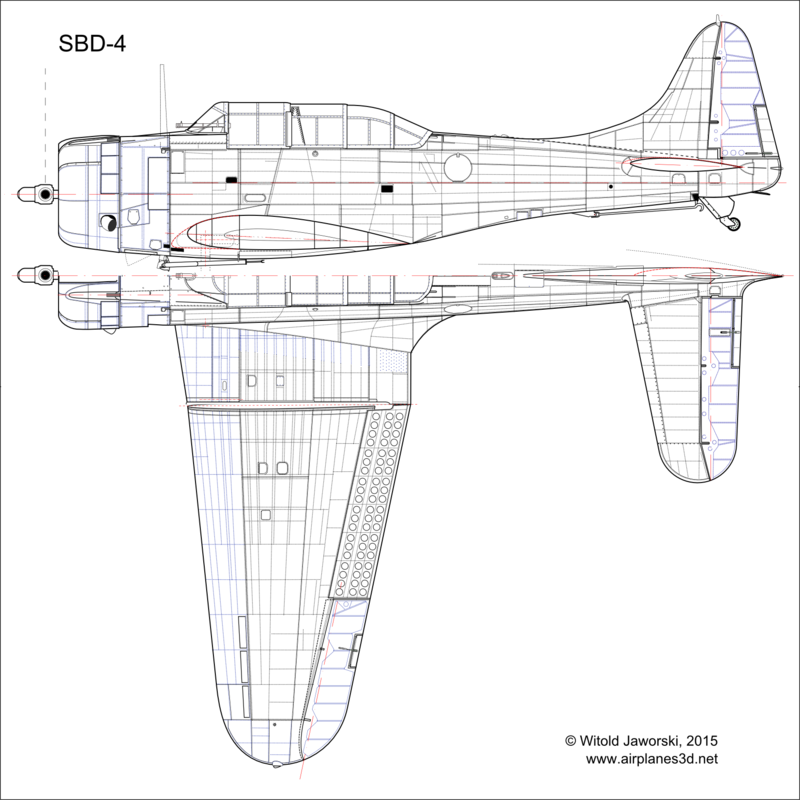 I did not prepare drawings of the last Dauntless version — the SBD-6. It had even more powerful engine (R-1820-66, rated 1350 HP on takeoff). Douglass built 450 of these airplanes between April and July 1944. Their radars were fitted in the factory. However, there is no external difference between the SBD-5 and the SBD-6! In the next post I will report my progress in building the first part of this airplane — the wing. As always, a very impressive eye for detail Witold- I wish I had 1/2 your dedication to a project.